Cell Network Search This send data to Apple to let Apple know which cell towers are being used. It's safe to turn this off. Compass Calibration This is specifically for the compass app. If you never use the Compass app, feel free to disable. Emergency Calls & SOS Keep this enabled. Find My iPhone Keep this enabled incase you lose your iPhone! HomeKit If you don't use HomeKit, you can freely disable this. 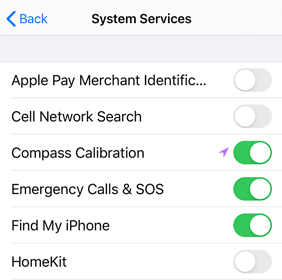 Location-Based Alerts Some apps, like HiFutureSelf, tell your device to trigger an alert when you cross a specified geographic area (geofence). The location data doesn't leave your phone. If you use HiFutureSelf Location based alerts or want the Wallet to show your Boarding pass when you arrive to the airport, keep this on. Location-Based Apple Ads No, thank you. Motion Calibration & Distance Mostly used by fitness apps. It's safe to disable. If you find your fitness apps are not functioning correctly, you can re-enabled it later. Share My Location Unfortunately friends get lost. If you have friends, and need to share your location from time-to-time to make sure you find eachother... you'll need this enabled. Wi-Fi Calling WiFi calling basically uses your WiFi instead of your network provider to make calls. Some cell providers like T-Mobile support this. If you use Wi-Fi Calling, you'll need this enabled. Wi-Fi Networking & Bluetooth This is just like the Cell Network Search setting, but for Wi-Fi. You can safely disable it. Significant Locations As Apple phrases it: "Allow your iPhone to learn places significant to you in order to provide useful location-related information". NO! Popular Near Me I'm not popular and I don't care. 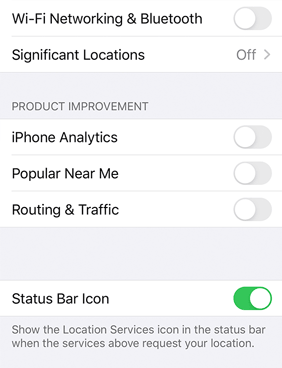 Routing & Traffic Apple monitors your speed and location and uses that to inform the traffic level in Apple Maps. Nope. Status Bar Icon YES. This will show the location icon in the status bar anytime your location is pinged.